According to Mayr Power Transmissions, high bolt tightening torques can prove a real challenge when installing large shaft couplings, especially in restricted spaces. The company’s new ROBA-DS disk pack coupling has been designed to provide a backlash free, positive locking solution which works with very low tightening torques. With new sizes covering a nominal torque range of 22,000 to 110,000Nm, the flexible disk pack is coupled via a new cone connection to the transmissions hubs instead of using the traditional ground bolts with frictional locking. 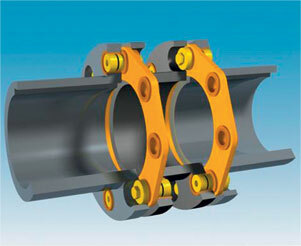 This positive connection is backlash free and reduces the screw tightening torques to a fraction of the equivalent friction locked couplings. The installation and de-installation is substantially easier and can be carried out without displacement of the hubs.